N 52° 19' 43.9" W 009° 46' 53.8"
One of the arcades on each side of the northeast window. Once it housed an effigy that is now kept in the exhibition area. It is said that St. Brendan founded a monastery here in the 6th century though no visible traces of it survive today. A later building was erected at this site in the 11th century and a small section of this building can be seen in the north wall of the nave. This first church was heavily damaged by a lightning in 1046. The current building was built over a 500 years period, from 12th century to 17th century. The only oldest part of this cathedral is the southwest Romanesque doorway which dates to the 12th century and is the only remnant of the 11th century church. Unfortunately we couldn't see it because the whole southwest gable was undergoing restoration works at the moment of our visit. The northwest wall, part of the southwest gable, the northeast gable with its wonderful three-light window and the southeast wall with the fine nine lancet windows are from the 13th century. In the 15th century the battlements were added. The southeast transept was built and reshaped between the 15th and 17th centuries. Today the transept is the main entrance to the church and is also an exhibition area for some interesting items that have been stored there for protection. A further building, known as the Priest's House, with massive buttresses, was added at the north-northeast corner in the 18th century. The cathedral is a nave and chancel building and is extremely long, about 33 metres long. Its width is about 7 metres. In the east end of the church there are three large and two smaller sedilia right under the first four lancet windows that are shorter than the other five. 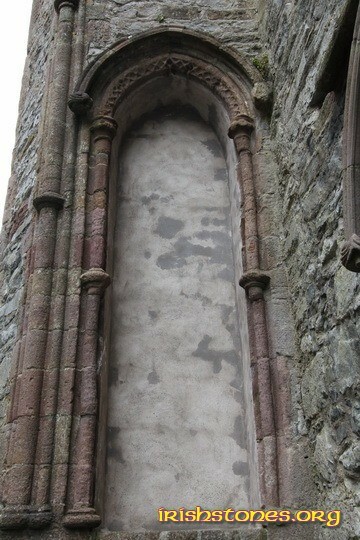 Either side of the northeast window there are two blind arcades that once housed two carved effigies of ecclesiastical figures dating to the late 13th century or early 14th century. These two effigies are now kept in the exhibition area in the transept. The three lights of the northeast window are extremely tall and the central light is one of the tallest ones still surviving in Ireland. The chancel is aligned to northeast (65°). It was a very cold day when we came here and we felt quite uncomfortable with the wind, so the visit to the cathedral was a little shorter and hastier than we would have liked. We came here for the first time on May 14th, 2002.